The room was nice and very clean. Breakfast was really good and the people were very friendly. Amazing hotel room! Very clean and modern. Central to most of everything. What can I say. The service was excellent from start to finish. I would definitely stay again on my next visit and recommend the Spring Hill Suites by Marriott to anyone. You would not regret your decision. My family truly enjoyed their stay.. I was pleased with our stay. The room was really nice. Everything was clean and modern. Breakfast was good. I would’ve rated it a 5, except parking was $15. So damn expensive. That’s the only thing keeping me from rating it 5 stars. The hotel is clean and comfortable. The staff is extremely helpful and friendly. The free breakfast is a wonderful touch. Housekeeping did not clean the room or even took out the trash. Pool was closed for a day. Hotel was ok. Just not Marriott Standards. On days that were 112 degrees the staff stopped putting out water about 6pm. 2 hour window for breakfast made it a little hard to sleep in and be on vacation. Restaurant staff seemed poorly trained and one of the shuttle drivers was very rude. Very clean and modern rooms must have been newly remodeled. Every amenity in room and WIFI worked flawlessly unlike Venetian which sucked. The fridge is convenient for left overs or snacks. Bedding was clean and comfy. Bathroom was plenty of hot water with draining sinks and sparkly clean. The free fruit waters and breakfast in lobby were welcoming. Lobby is large and comfortable for breakfast when it gets fairly crowded. Parking is easy and convenient and free. Price is wonderful compared to strip prices. walk to monorail 400 feet or bus stop closer than that and to anywhere you want for $5. The room was fine, although, I didn't feel as though I should have to put sheets on the pull-out bed. In addition, having only flat sheets was difficult as was only having one pillow for the pull out. I reserved a room for 4, it should have been a given. Having reserved the room and paying for it (but putting it in my significant other's name). I was frustrated when I went to get a replacement card (the one I had returned wasn't working) and was told that I needed to provide a photo ID. As my significant other's name is not the same as mine, they wouldn't provide a key with out confirmation that it was okay. Keep in mind, this was after giving 2 keys to the minors in the room without authorization. There was also a marathon in the area that the concierge notified us about, but was unable to provide any details on the impact to our stay. Speaking with the front desk later that evening provided no additional information other than the statement " I don't know where it will be, but it won't impact you" - and then being left at the desk as they walked away. The following day, after providing my name and number, I was able to get some limited information. The toilet flush handle was broken when we check in our room. This is one of the less expensive chains in Vegas. The lobby, parking garage, and staff were all excellent. Pool area was a bit worn, but amazing as it was on the top floor. Incredible views. Room was a bit worn. Scuffs, worn furniture, "hot" cold water, horrible coverings for pull out couch. That could have been taken care of easily by the staff you'd think. Carpet was stained. We felt safe and comfortable, but the room didn't cool very well. We stayed on the 13th floor. Go figure. A great and convenient place to stay. Everything you need is on site - gym, restaurant. Free breakfast is excellent - a full spectrum of food choices. Las Vegas Convention Center is a short stroll from SpringHill Suites by Marriott Las Vegas Convention Center, and other popular attractions like SLS Las Vegas Casino are within a mile (2 km). This 299-room, 3-star hotel welcomes guests with conveniences like an outdoor pool, a 24-hour fitness center, and free in-room WiFi. It's connected to the convention center in central Las Vegas and also close to Fashion Show Mall and High Roller. Free hot/cold buffet breakfast is served on weekdays from 6:30 AM to 9 AM and on weekends from 7 AM to 9:30 AM. Enjoy a bite to eat at the hotel's restaurant, or relax with a drink at the bar/lounge. A 32-inch flat-screen TV comes with cable channels, and guests can stay connected with free WiFi and wired Internet. The bathroom offers hair dryers and free toiletries. Other standard amenities include a sofa bed, a sitting area, and a refrigerator. At SpringHill Suites by Marriott Las Vegas Convention Center, guests enjoy features like an outdoor pool, a 24-hour fitness center, and free WiFi in public areas. Self parking is available for USD 19 per day. The 24-hour front desk has staff standing by to help with dry cleaning/laundry and securing valuables. Additional amenities include conference space, a 24-hour business center, and a seasonal outdoor pool. Thank you for your excellent review! 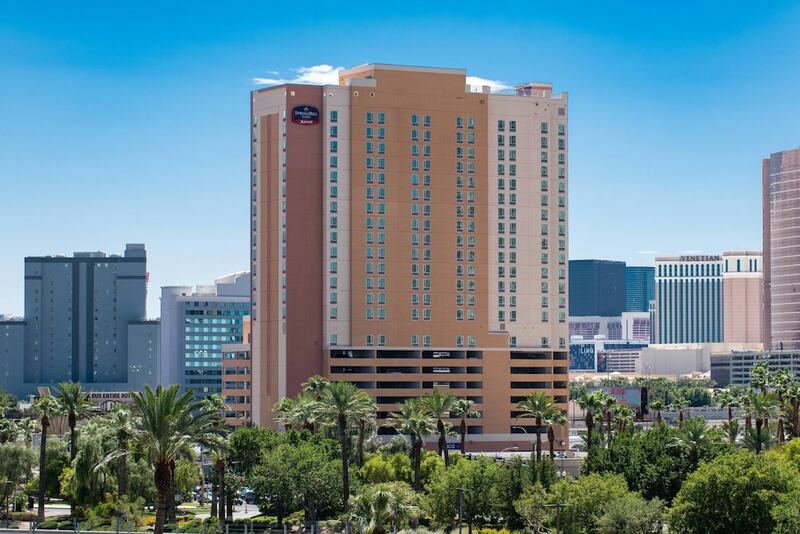 We'd love to have you stay with us when you return to Las Vegas! Hello, Thank you for your outstanding review! We will be happy to serve you again as a repeat guest with us! Thank you for your excellent review! We will be sure to pass along your kind comments to our breakfast team. We look forward to being of service to you again when you return to Las Vegas! Hi Mario, Thank you for your review. I'm sorry your linen was dirty. We have reviewed your information with Housekeeping to ensure this does not happen again. We hope to see you again when you return to Las Vegas. Thank you for your excellent review! We look forward to being of service to you again when you return to Las Vegas! Thank you for your outstanding review! We look forward to having you again when you return to Las Vegas! Safe Travels. Thank you so much for your kind review. We are glad that your family enjoyed your stay here so much! We look forward to being of service to you again in Las Vegas! Thank you for your good review, how can we make it a 5/5 for your next trip? Free hot/cold buffet breakfast is served on weekdays from 6:30 AM to 9 AM and on weekends from 7 AM to 9:30 AM. Palettes Gallery & Bistro - Restaurant specializing in American cuisine and serving breakfast, lunch, and dinner. Recreation features at SpringHill Suites by Marriott Las Vegas Convention Center include an outdoor pool and a 24-hour fitness center.